Earlier this year, Governor Terry McAuliffe issued a pardon to Robert Davis – a man convicted of a brutal double murder after he falsely confessed to the crime. McAuliffe did not pardon another convicted killer, a former UVA honors student from Germany. 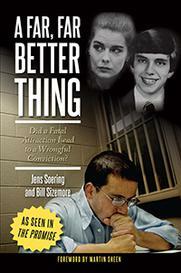 Jens Soering insists he also gave a false confession, hoping to save the real killer from execution. The fatal love story of Jens Soering and Elizabeth Haysom will soon be told in a documentary called The Promise. If you lived in Virginia in 1985, chances are you know the story. Jens Soering, the son of a German diplomat was accused of killing his girlfriend’s parents in their Bedford County home. The two traveled the world before being arrested in England where they were charged with check fraud. 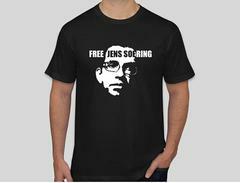 After being questioned for more than 16 hours over four days, Soering confessed to the crime. But today, he says that confession is proof of his innocence. “The way you can tell it’s a false confession is by checking what I said against the physical evidence at the crime scene,” says Soering. The state of Virginia believes it’s dangerous to allow a radio reporter to record an interview at the Buckingham Correctional Center, so we spoke with Soering by phone. He recalled telling police that he acted alone when he killed Nancy and Derek Haysom. He says, “What the police found at the crime scene was all four blood groups – the two blood groups of the victims and two other blood groups, so that already tells you, at the very least, there were at least two perpetrators. Now one of those blood types was his. He says, “I am blood group O, and that is the most common blood group.” But years later – when technology allowed for DNA testing, investigators found no sign of Soering in the Haysom home. Soering says, “The police tested 42 blood samples from the crime scene. Thirty-one of those were too small or too degraded to yield positive identification, but 11 of the blood samples could be tested, and all of those were from somebody else – definitely not me." “He put one of them in the patrol car in the back and frisked one of them, and then he put the other one in the back of the patrol car and frisked the first one, and then he let them go. Later on, when he returned to the police station, he found this buck knife – this hunting knife – in the back of the patrol car." Steinberger says, “You know killing with knives is not very usual. It is actually very hard to kill a person with a knife. This was never, ever mentioned in court.” In 1996, lawyers brought that discovery to the attention of a judge, who ruled it would not have changed the outcome of Soering’s trial. Karin Steinberger’s documentary challenges that point and suggests the existence of a missing FBI profile of the killer – a woman who was close to her victims. None of this has swayed Governor Terry McAuliffe, who had the chance to send Soering back to Germany but decided to keep him behind bars in Virginia.